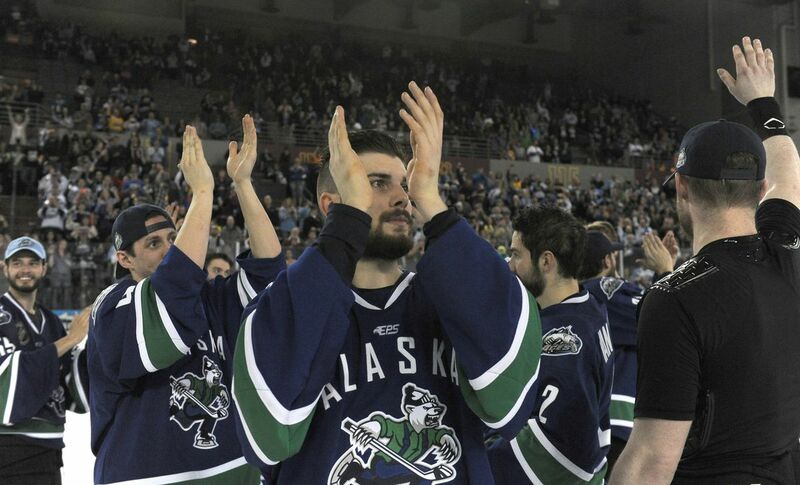 It was sweet and sorrowful, a celebration tinged with sadness, at once a slice of hockey heaven and a sliver of hockey hell, and then the Alaska Aces were no more. This was deep into Saturday night, postgame inside Sullivan Arena, where a standing-room-only crowd of 6,273 remained to make the long goodbye last a little longer. This was after the Idaho Steelheads gathered on the rink near the exit to the visiting locker room immediately after the final horn and reminded us that class always tells. They tapped their sticks on the ice, a show of respect for a rival whose history with them stretches back two decades. And then minutes later they were back. 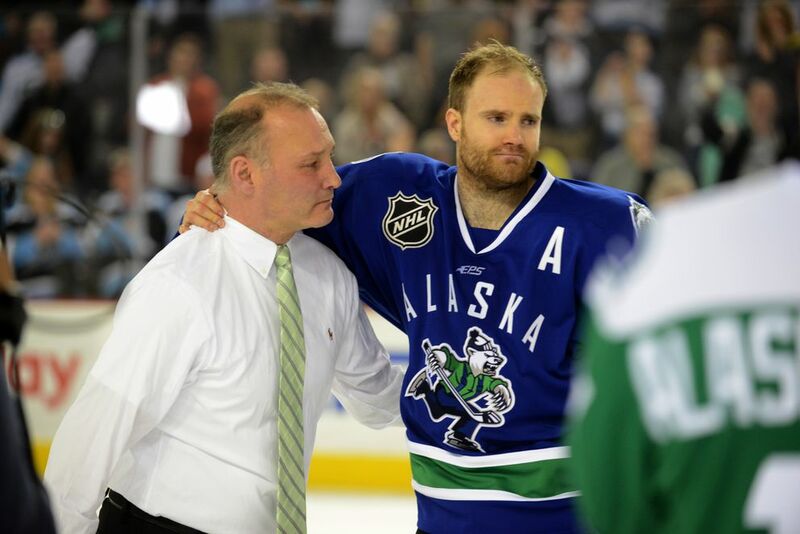 They returned to the ice for one last goodbye, stretching out the memories. Most Aces still wore their skates, some with their shoulder pads removed from beneath their sweaters. Coffman came out in compression shorts, socks and his ever-present post-game hoodie, the hood pulled over his sweaty black hair. As fans applauded, the Aces applauded them back. Hunt and Murray shook hands, and shared a hug. They are two men tougher than trigonometry – you need only a glance at their rink resumes to understand that – but both are leakers, hard men with a soft side. After 14 seasons in the ECHL as the Alaska Aces, and stretching back more than two decades to years as the Anchorage Aces, a franchise folded. The owners in February cited deep, continuing financial losses as the reason they were shuttering the club at season's end. That move will leave a gaping hole in Alaska hockey – the UAA Seawolves will be the only high-level hockey in Anchorage — and a similar-sized void in a lot of hearts. There was a time when such an event seemed unimaginable. The Aces won three Kelly Cups in their first 11 seasons on the ECHL circuit – 2014 under Murray, 2011 and 2006 under Brent Thompson and Davis Payne, respectively. Crowds packed Sullivan, particularly for the playoffs. And the most passionate fans, The Cowbell Crew, rang their noisemakers so loudly that some nights you thought they might blow the roof off the joint. But good times never last long enough. The Aces failed to make the playoffs each of these last three seasons – Idaho eliminated them from playoff contention with its 2-0 win Friday – and the fans stopped coming. The customary crowds of 4,000-plus and 5,000-plus declined steeply and the current recession in Alaska compounded the accounting misery. This season's club mirrored the franchise's ECHL history – sizzling start, frustrating finish. Still, if Friday marked a funeral – so long, playoffs – Saturday played out more like a wake, though the kind where you have a helluva good time, where you can both smile and cry a river and share emotions with friends. Some tailgaters set up shop in the parking lot three hours before the game. An hour before puck-drop, long lines snaked at concessions and the line at the Aces' merchandise booth stretched dozens deep. All around the rink, fans wore the jerseys of former players. Here a fan wore Keith Street's No. 8 – Street piled up points like kids acquire LEGOs. There a fan was draped in Dean Larson's No. 18 – Larson was the littlest big man, a playmaker extraordinaire. The old No. 15 of Bryan Miller appeared – he was an offensive defenseman who endured four shoulder surgeries to pursue his dream. There was the No. 21 of Steve Ward, a former captain who once blocked a shot that, it turned out, broke his leg. Yet he went out and tried to take another shift because, well, he was a hockey player. And a No. 9 Derick Martin sweater – who could forget? He took a puck to the face one night, needed extensive dental work and dozens of stitches, and suited up for the next game – little wonder teammates called him The Machine. As Martin explained it fairly matter-of-factly back in the day, with a shrug and a wincing smile, his injury was a long way from his heart. As for the game, it was of a piece with the Aces' recent fortunes. The Steelheads shut them out Wednesday (2-0) and Friday (1-0), and that marked the first time in the Aces' ECHL experience – the final tally was 1,155 regular-season and playoff games – they were fed a bagel in consecutive games. Saturday looked like more of the same. The Aces were goal-free deep into the third period before Peter Sivak and Stephen Perfetto worked a give-and-go-and-give-and-go, and Perfetto cranked a one-timer top shelf with less than four minutes to go to turn the crowd delirious. Less than three minutes later, Yan-Pavel Laplante scored an extra-attacker goal to cut Idaho's lead to 3-2. "Let's make some noise for the boys!'' Lester implored. That's how it ended, though, with the Aces on the wrong side of 3-2. One final jersey auction followed, and then all but the last of the crowd drained out of the building. Seventy-five minutes after a franchise played its final shift, seven of the Aces' teenage stick boys played shinny on one end of the ice. Aces staffers — Murray and his family among them — took photos and lingered at the other end of the rink. 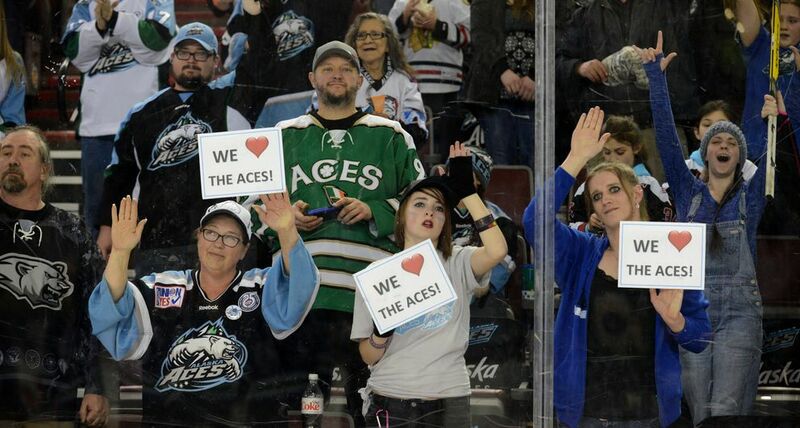 Some of the Aces' most hard-core fans hung out at the top of the lower bowl. At the autograph table manned by an Aces player after each game, Hunt scrawled his last signature as the clock closed in on midnight. The last of the long goodbye lasted a little longer. The only sounds were a few conversations, the crack of puck meeting stick and the low tones of noisemakers as the last of the crowd intermittently trickled toward exits. The Cowbell Crew was silenced, replaced by crickets. Doyle Woody was a longtime reporter for Alaska Dispatch News, and before that, the Anchorage Daily News, covering hockey and other sports.